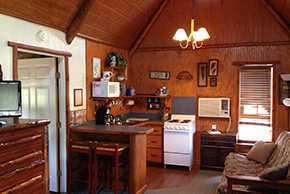 For the last decade, Trickle Creek Cabins has made its home in charming Glen Rose, TX, where they offer visitors and vacationers cottage rental, or a vacation cabin. Located just minutes from several Glen Rose attractions, Trickle Creek Cabins is an ideal location for your vacation getaway! Whether you choose one of their cabins or cottages, you are guaranteed a weekend of relaxing fun at Trickle Creek Cabins. Each has its own private hot tub, charcoal grill, and fire pit. The kitchens are fully stocked with coffee pots, toasters, ranges, and microwave ovens as well as cooking utensils and dishes for serving meals. ​ On top of that, Trickle Creek Cabins provides air conditioning and heating in all of their cabins for year round comfort! You won’t miss a bit of fun whether you are relaxing in the hot tub or visiting the wildlife attractions in Glen Rose. Take a fifteen-minute drive with the family to take in the sights at the Dinosaur Valley State Park, or go a little bit further and check out one of the major attractions in Glen Rose – the Fossil Rim Wildlife Center. If outdoor fun is what you are looking for, check out canoeing or the Squaw Valley Golf Course to hit the links. Bring the kids to Big Rock Park and climb the giant rocks and wade in the trickling waters. There is something for everyone when you stay at Trickle Creek Cabins! When you come back to your cabins or cottages, there is still a lot of nature to be seen. They have a 160-acre property with walking trails, a catch and release fishing pond, and are dog friendly, as long as you keep them leashed and clean up after them!